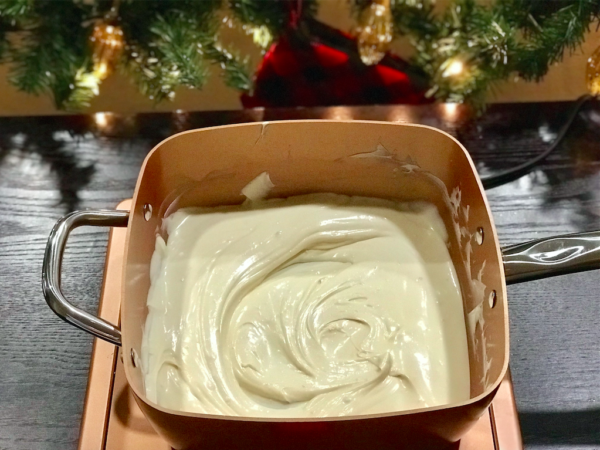 One of my favorite things about the holiday season is baking delicious treats! I love putting on a Christmas movie and just baking away! I make more treats than the hubs and I should ever eat, so I package them together to give out as gifts and take to Christmas parties. It is something I look forward to every year. 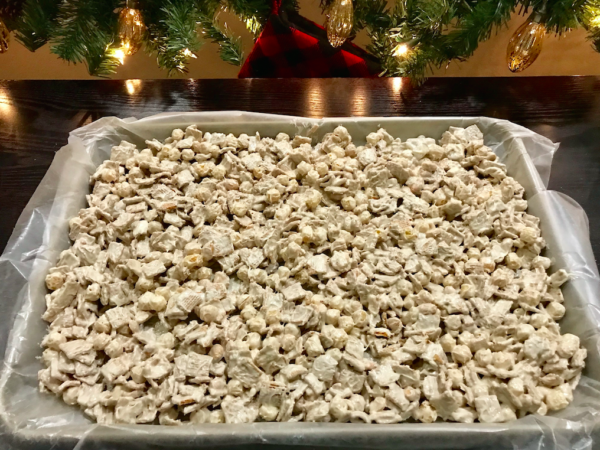 One of my go-to staples is making Christmas Crunch candy! 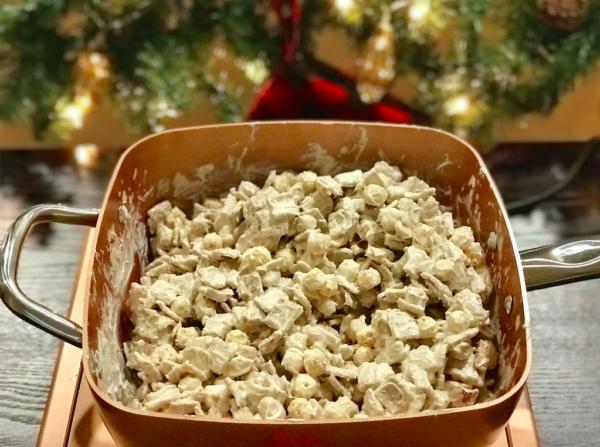 My aunt has made this delicious treat since I was little and it is absolutely amazing! 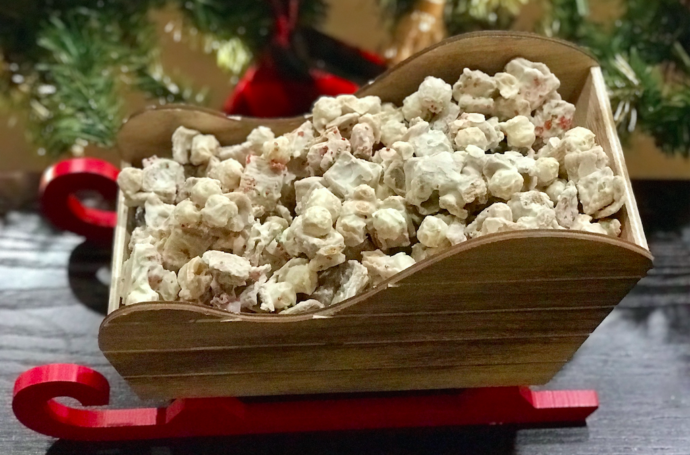 She has this amazing treat corner in her kitchen and every year at Christmas, it is filled with the most delicious Christmas treats! I still feel like a little kid every time a make a beeline for that corner. She taught me how to make this several years ago and I am still amazed at how easy it is! 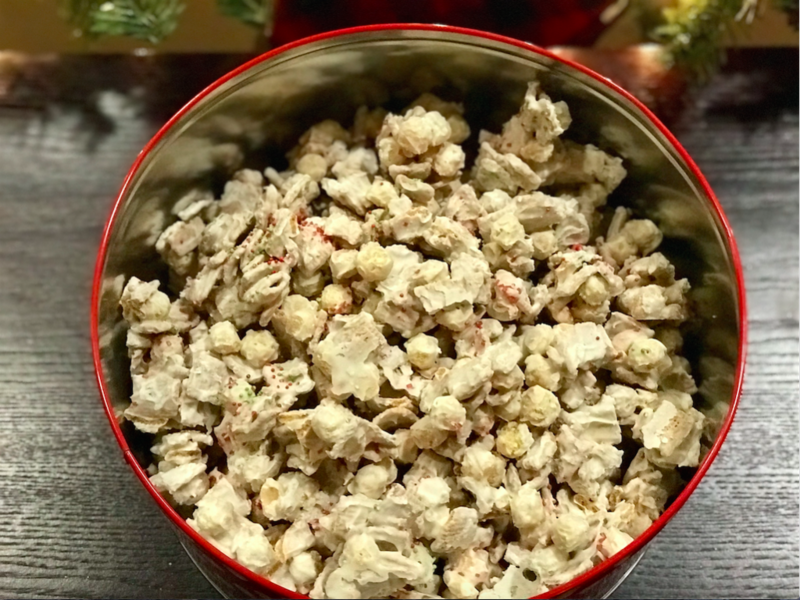 This is the perfect treat to take to Christmas parties or to just make for a tasty Christmas treat! Add the almond bark to a pan and stir continuously until completely melted. 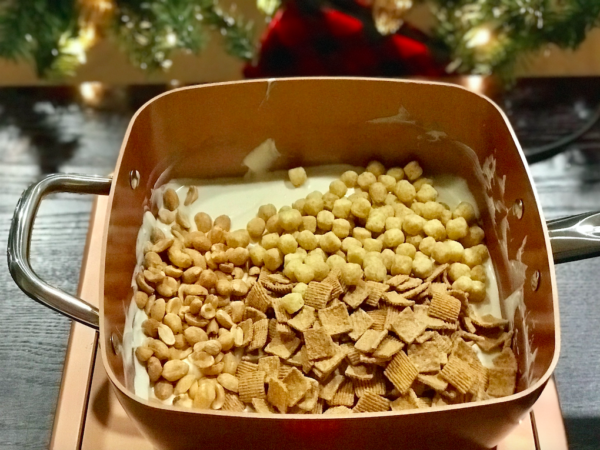 I personally love using my Copper Chef because it is evenly heated, so it melts the almond bark more quickly and it doesn’t stick to the pan! You will be so thankful for this when it comes time to clean up! 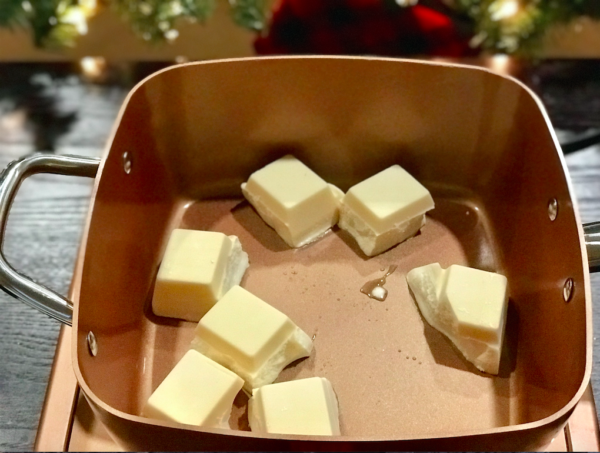 If you don’t have a copper chef, you can use a big pot or double boiler. Just make sure you keep the heat on low. Once the almond bark is completely melted, gradually stir in the cereal and peanuts. I didn’t put an exact amount because this is completely up to you! I like to gradually add the mix-ins until all of the almond bark is covering the cereal and peanuts. You don’t want the coating to be too thick because it will cause the candy to be too sweet. Cover a baking pan with wax paper. 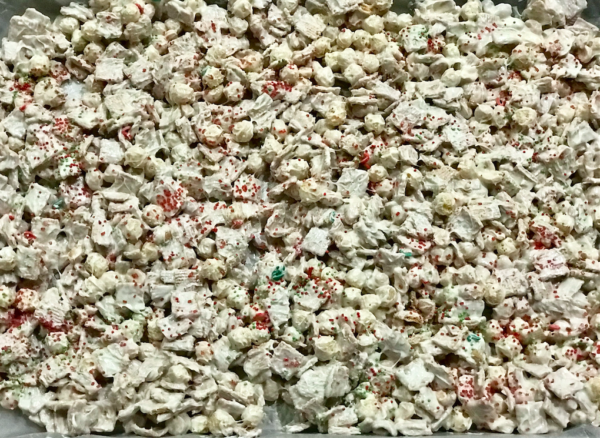 Spread the mixture out onto the wax paper and add the sprinkles. I just do a few sprinkles for decoration. Allow the candy to dry completely and then break apart and add to your serving dish or storage tin. How is easy is that? I promise you will want to make plenty of this because it will be gone in a second! Merry Christmas, friends! 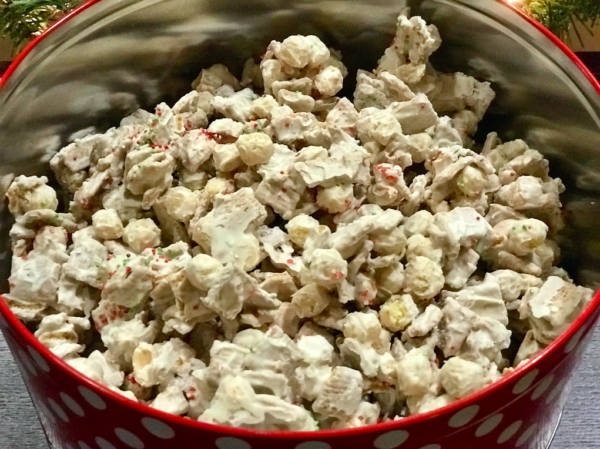 A delicious holiday candy recipe that is super easy to make and will be the hot of every Christmas party! Add the almond bark to a melting pot and stir continuously with the heat on low until completely melted. Once the almond bark is completely melted, gradually stir in the cereal and peanuts. Keep adding cereal until all of the almond bark is covering the cereal mixture. Cover a baking pan with wax paper. Spread the mixture out onto the wax paper and add the sprinkles. Allow the candy to dry completely and then break apart and add to your serving dish or storage tin.